Regular customers at Glamour Nails, a popular nail salon on Goshen’s southeast side, know that Michael Nguyen won’t only give them a quality mani or pedi, but likely keep them laughing through much of the process. 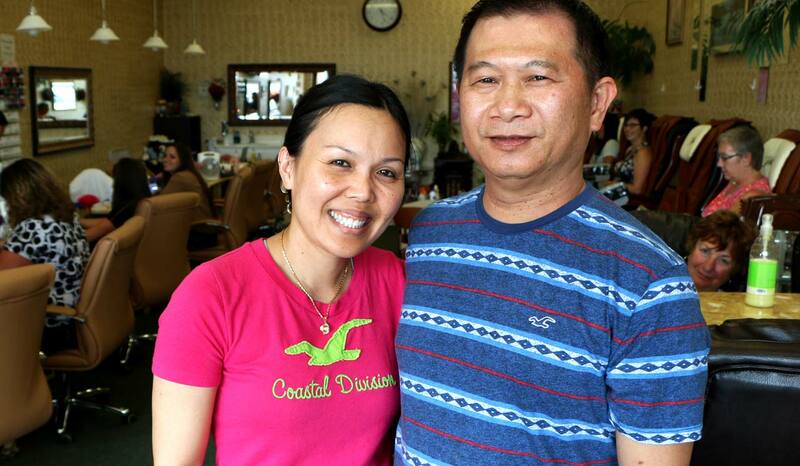 Michael and Trinh “Tonya” Phan Nguyen together own Glamour Nails, a business conveniently located near their home. “We have four kids to raise and we wanted something flexible for when we need to run back and forth to help with homework or pick them up,” Tonya said. Mike had worked for several years in different factory jobs in the area, making money to support his family. He came to a point, though, where he did not want to work for anyone else. He wanted to own his own business. They both attended Elkhart Beauty College to become nail technicians and, in 2006, opened Glamour Nails. Opening just before the nationwide recession began to hit the area meant the Nguyens struggled to keep their business open at times. But they did, likely due to their dedication to taking the time to do their work right and honestly. Mon – Fri • 9:30 a.m. – 7:30 p.m. Sat • 9:45 a.m. – 6 p.m.
Sun • 11 a.m. – 4 p.m.
Life hadn’t been easy for Mike and Tonya. Mike moved to the U.S. in December of 1980 from his home in southern Vietnam to escape the war in the country. A Mennonite church southwest of Goshen sponsored Mike and helped him get settled in the area. He graduated from high school and began working in factories in the area that supplied parts for the RV industry. Twenty years ago, Mike caught word that there was a young woman in Warsaw, a city just south of Goshen, who had also moved recently from Vietnam. He sought her out and, in 1994, they were married. “He chased me,” Tonya said with a giggle. They are glad to have ended up in the community of Goshen. “It’s a smaller and safer community than some cities, and a good place to raise kids,” Tonya said. The Nguyens aren’t only proud to run their own business in Goshen, but of the lives their four children have made here – ages 18, 15, 13 and 11. Their oldest son graduated from high school this past spring and is attending Goshen College. He plans to pursue a career in the medical field. Mike and Tonya have continually encouraged their children to embrace education. They have all been top students at Bethany Christian Schools. “I think Goshen is a great place to live,” she said.